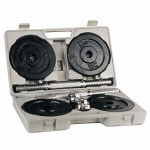 Set inSPORTline DBS2181 is a unique and affordable set of one-hand loading dumbbells with cement filling. 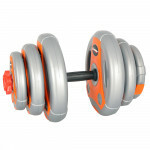 The axle of the dumbbells is made of high quality metal material and is threaded at both ends for safety sockets. Discs of the dumbbells are then made of plastic with cement filling. 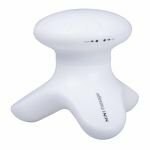 Thanks to the loading system the weight of the dumbbells can be adjusted quickly and easily which allows many kinds of exercises for all performance categories of users. The dumbbell´s axle of 30 mm diameter allows loading weights with 30 mm drilling. Two metal axles with a diameter of 30 mm. With grooves of grip, weighi..
You can easily train the muscles of your hands, abdomen and chest. .. 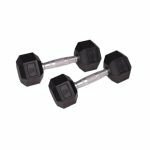 Stand for dumbbells made of high quality steel, robust construction, e..
12 kg chrome dumbbell with ergonomic grip..
Loading Barbell and Dumbbell Set inSPORTline BS08 3-50 kg is a unique and very affordable set of a barbell and adjustable dumbbells with a cement filling. .. 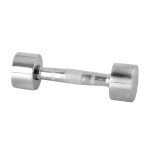 This dumbbell is suitable for versatile usage. 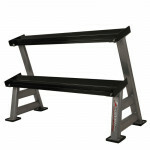 Ergonomic non-slipping grip is made of steel allows you to perform more difficult exercises..